It’s about being talented, successful and dynamic – but for internationally renowned composer and conductor Eímear Noone, a County Galway native, it’s also about giving something back to the country that made her. This April, Eímear – who has carved out a successful international career composing music for video games, feature films and TV – will host what is expected to be one of the most unique tech events ever to visit this country: the first Dublin International Video Game Music Festival (iDIGMusic Festival) at Dublin’s Convention Centre. Eímear, now a resident of Malibu, California, is one of the world’s foremost conductors of video game scores, both in the studio and in the concert hall (credits include ‘Heroes of The Storm’, ‘Starcraft II’ and ‘Diablo III’). The latter won the 2012 GDC award for best audio, which includes the award for music, the 2012 Hollywood Music in Media Award for Best Original Score, and a 2013 BAFTA Nomination for Original Score. Now the 37-year-old musician from Kilconnell and her husband Craig have thrown themselves and their production company, Twelve O’Clock Arts, into the organisation of an event which is expected to bring some 6,000 ‘gamers’ (video game players) to Dublin. The iDiG Music festival will feature top international performers and composers from the mega gaming industry – Grammy award-winners and BAFTA nominees – in a series of events, which she wants to be the gaming equivalent of the International Web Summit. There will be tech demos, round-table discussions and workshops, while the festival, which runs from April 2nd to 4th, will also act as a shop window for the Irish gaming industry as the work of Irish technology, music and animation experts is displayed to the international community. It’s Eímear’s hope that the Dublin International Game Music Festival will establish the Dublin as an annual cultural hub for video game music and shine a spotlight on the burgeoning game development industry currently flourishing in Dublin. A perfect example of what an Irish education can lead to, Eímear co-founded the Dublin City Concert Orchestra aged just 21. Its honorary patrons included John Boorman, Elmer Bernstein and Noel Pearson. 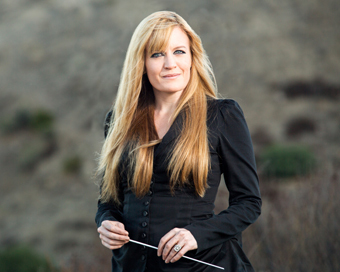 She has also conducted at prestigious black-tie venues such as The Sydney Opera House, The Mann Center, Madison Square Garden, and The Greek Theater and led countless ensembles in video game music at the Sydney, Dallas, Baltimore, Colorado, Pacific and Houston Symphonies, The Philadelphia Orchestra, and The Royal Philharmonic, to name but a few. Eímear says she tried hard to convince promoters to bring these mega-shows to Dublin, but they were sceptical of Dublin’s size. Instead she’s bringing the international games industry to Dublin herself in an event featuring multinational giants such as Google and Youtube. In fact, musicians in Youtube studios around the world will be linking in with performances by the festival musicians in Dublin – the first time this has ever been done. Her production company is funding the entire event. “We’re assuming the risk because our belief is that it’s worth it.” It’s a huge vote of confidence in the talent and the technological work that’s happening in Ireland and Eímear is prepared to put all of her resources into it.